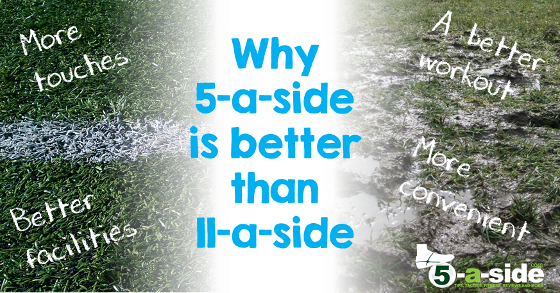 Is 5-a-side really better than 11-a-side?! That claim is going to be like fighting talk to some people, but, in the eyes of many people 5-a-side is the winner! It’s already a fact that there are now more people in England playing small sided games than there are playing the full 11-a-side version so could it be a claim that most people agree with?! It’s time to take a look at the reasons why the 5-a-side game is dominating. Let’s not beat about the bush: 5-a-side is that it gives us a lot more touches, and more chance to display our silky skills on the pitch. Surely that’s what football is supposed to be all about? With the smaller space available, and the smaller number of players, you’re never far from the action. Whilst there might be potential for a hung-over Sunday-league player to sheepishly hide away at left back for a full 90 minutes in 11-a-side, you’re going to be fully involved in the game if it’s 5-a-side. Being involved is something that we should all be embracing. Let’s face it, when we played the game as kids we all chased the ball around as though our little lives depended on having it. We charged around after that ball as if we were some kind of Gollum-like creatures hell-bent on having possession of the ‘precious’. Although we’ve grown up and learned a few more things about positional play (and I no longer look like Gollum, honest), the best part of the game for us all is still when we’ve got the ball at our feet. 5-a-side gives you more time for skills. But if you like kicking the ball long and high, 11-a-side might be the choice for you. I used to play in central midfield for an 11-a-side team and some games I wondered if I’d be better off joining an athletics club rather than a football team. Don’t get me wrong, overall it was a good time, but some games seemed to consist of just running hopefully from one end to end of the pitch to the other whilst the defenses decided to bombard the opposition with speculative long passing as if the ball was some sort of artillery with which the opposition needed to be mercilessly shelled. The opposition defense and goalkeeper would, in turn, respond with their own return of fire, attempting to match our defense’s long punts round-for-round. The strikers would do their best to feed off the ‘scraps’ – often just the mistakes and gaffes of a battle-worn back-line, whist the midfield would run back-and-forth in a sort of no-man’s land watching the bombardment of long passes whistle over head. Occasionally the ball would land in the vicinity of a cultured player who had the audacity to try to indulge in a couple of seconds of trying to get some passing going along the floor, or maybe a couple of skills; even a cheeky dribble perhaps. Of course that was usually frowned upon with derisory cries of “don’t f*#k about with it there! !” being hurled in their direction. 5-a-side conveniently tries to cut out most of the nonsense of the 11-a-side game and strips the game back to its core skills. It’s the best bits of the 11-a-side game gently distilled down for our enjoyment, with a focus on passing, dribbling, shooting and keeping possession. Every player is involved and everyone gets more action. As if you’re not sold already, FIFA performed a study comparing 11-a-side to small sided versions of the game and found that in 4-a-side football players get 5 times more touches than 11-a-side, whilst 7-a-side produces twice as many touches than in 11-a-side. Another study found that players got over 4 times as many touches in 60 minutes of 5-a-side as they got in a full 90-minute game of 11-a-side football. Touch, pass, throw in. Pass, tackle, throw-in. Dribble, shot, goal-kick. That’s a bit how 11-a-side can feel at times, with the ball spending a lot of time out of play followed by a set-piece. In fact, FIFA found that the ball is out of play for a whopping 34 per cent of the time in 11-a-side football! If you’re playing 5-a-side with barriers around the pitch then it goes out precisely 0 per cent of the time! But even where you’re playing a version of 5-a-side where the ball can go out of play such as Futsal, the ball spends more time in play than the 11-a-side game (it’s out of play only 8% for 4-a-side and 14% for 7-a-side to use FIFA’s statistics). In getting rid of this stop-start annoyance 5-a-side results in a more intense experience that’s a better workout as well as having the potential to be more exciting. 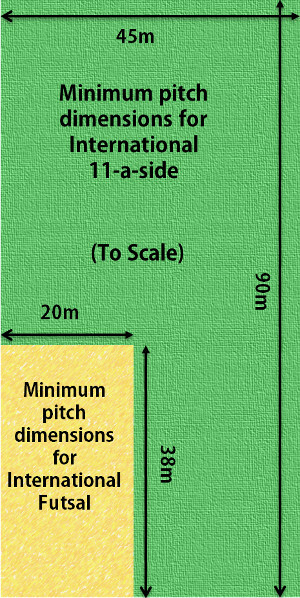 A futsal pitch is a lot smaller than an 11-a-side pitch, skills need to be tighter and the ball goes out of play less. 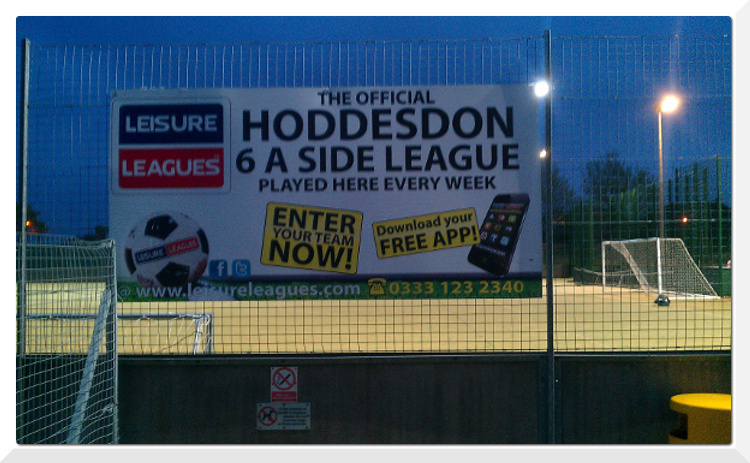 Ever wanted to keel over and die after playing 5-a-side? Don’t worry, that’s called getting fitter (as long as it isn’t actually something you’re legitimately going to keel over and die from – in which case go and see a doctor). It turns out that playing football in general is actually better for your fitness than just going for a run or lifting weights. It can help cut the risk of heart disease by reducing blood pressure and cholesterol levels, and is also a good way to lose weight. But lo and behold, the benefits don’t just stop there. As we’ve covered elsewhere, playing 5-a-side is even better for your fitness than playing 11-a-side. Yes, because you’re constantly involved when you’re playing 5-a-side, and you’re required to repeatedly perform bursts of high-intensity exercise, it has been shown to ratchet up your fitness levels quicker. When it comes to amateur level football there’s no debate, the facilities on offer to 5-a-side players are far superior to the 11-a-side game. Who really wants to try playing their 11-a-side football on a muddy, dog fouled quagmire when instead you could be playing 5-a-side on luscious synthetic 3G facilities, designed to give us the experience of playing on the finest pitches imaginable? Muddy quagmire or nice, flat 3G Astroturf? The superb consistency of the pitches is a major reason why the 5-a-side game is suited to playing passes along the ground and doing skills, whilst the 11s is often more suited to “not f*#king about with it”, to use the park football terminology. What’s more, the facilities are all well lit for evening football and many of them have a bar on the premises too, allowing us to enjoy a swift pint of ‘sports drink’ with teammates after the game. This is really a consequence of the superb facilities on offer that they can keep football going all the time. The only time that your 5-a-side might get called off due to the adverse weather is when snow has literally covered the pitch. Play your football indoors and you’re totally immune against all but earthquakes and tornadoes. 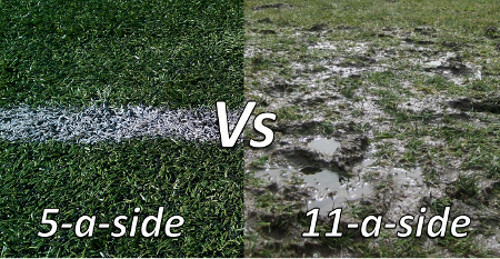 Anyone who has played 11-a-side in Europe, however will be familiar with the misery of having a handful of games being called off each season due to the pitches being unplayable, usually due to the pitch resembling a lake, rather than a football field. 5-a-side keeps going throughout the summer months, which are the best times to be playing – there’s nothing like getting your 5-a-side fix in the warm summer evenings. 11-a-side, on the other hand, shuts down for the off-season. This might be when the pros go on holiday and work on securing big transfer moves, but for the rest of us it’s just a time to go steadily more deranged at the lack of footballing action. Thankfully, 5-a-side leagues run all year round making sure we don’t ever have to spend some time apart with the game we love. What’s more, a 5-a-side season usually only lasts a couple of months meaning that you can become a champion over and over! Or, if things aren’t going so well, give you more chances to wipe the slate clean. In the UK we are now spoiled for choice in terms of 5-a-side providers – most urban dwellers will be no more than 5 miles from a league operating near them and they operate on many different evenings. In fact, we’re confident that it’s quite possible to start a 5-a-side team and get it playing in competitive games within two weeks (see how to start playing 5-a-side). The same cannot be said for 11-a-side. Competitions and tournaments are readily available and you only need to round up 4 mates to get started. It might still feel like hard work rounding up a squad of 5 players at times, but be thankful that you’re not trying to find a team of 11. Just one of many league venues all over the country. Well, you can’t expect to be reading a 5-a-side football blog and see a conclusion being anything different than 5-a-side coming out on top – and when you look at it, it’s a very reasonable argument to make! But we’re not totally blinkered. If you’re a lover of the 5-a-side game then the chances are you’re also a lover of the 11-a-side game. It’s hard to beat 11-a-side for the full experience, with heading, slide tackling, even long balls being a part and parcel of the game we all love to watch on TV. Ask us which we’d rather watch and we might just say 11-a-side, but ask us which we’d rather play and it would be 5-a-side every time. The Physical and Mental Benefits of 5-a-side – Hard research shows that 5-a-side has some seriously impressive physical and mental benefits – it might surprise you. Completely agree, turned 40 now and can still get invloved in 5 a side and make an impact. Better than busting my backside at 11s and getting murdered for pace every game! Love a game indoors too. Hi Si, completely agree with you there. I don’t know where I’d be without a game of fives in my life. I share your love of the indoor game too – something about a sports hall gets the senses on edge. Great article. I musst admit i enjoy playing 5-a-side better than 11-a-side because i am a ball player and one of my many positions at 11’s centre mid so i know how you feel about the athletics club. I was a winger when i was younger and that is even worse. All that said for a 31 year old bloke i still feel massively torn. Much more than i can explain as if some part of my brain thinks i’ve still got a chance. I didn’t play 11’s this season for the first time in years and i must admit some parts i didn’t miss some parts of it but everytime i watched a game i wanted to play. It’s like an addiction thats tough to give up. One thing for me to bare in mind is that i have very little time as i work full time and have a 1 year old daughter with a missus that continually utters the immortal words we’ve all heard if we have kids “is football more important than spending time with your daughter” although thats not the case it’s hard to argue with her so 5-a-side is spot on because the daughter is in bed but you can’t beat that smell of damp mud and physically getting dirty. Or that great long ball or commanding defensive header! It is a tough decision which one is better. If any. Really good article, I think this debate will go on for a very long time. I personally prefer 5-a-side purely for the pace and like you say, you actually get more touches on the ball. What I did notice was that after starting to play 5-a-side my control, and touch was noticeably better in my 11-a-side games. I have recently started my own 5-a-side kick about and found my pitch through MyLocalPitch.com (very handy website) and am now nearly 99% converted to the 5-a-side format. Hi Guru, thanks for the nice comments about the article. There are a lot of people who share your same view and the numbers of people playing the game of 5-a-side vs the numbers playing 11-a-side are showing it! There’s no denying that 5-a-side is a great game for getting more touches on the ball, which really helps develop technique. I really like that you’re carrying on playing both games, the two types can go together well. Thanks also for the tip about MyLocalPitch.com – I’ll check it out. Beautiful article! I’ve thought and spoken the same thing for many years. I have gotten some negative feedback. One thing I would add: You might say that if you are playing in an 11-a-side game then (depending on your luck in the game) most of the game you are just a spectator of a much smaller game happening somewhere else on the field. What a great comment – wish I’d have come up with that as a way of looking at it. When you look at the stats, you’re absolutely right: you’re not getting much action in 11-a-side and you’re spending a lot of time watching the play rather than being directly involved. Nice to hear from a fellow 5-a-side convert – please give the blog a follow and let us know if you’ve got anything you want us to cover!